Biggar Rugby Club head coach Gary Mercer is targeting a promotion challenge for his troops next season after this campaign’s topsy turvy nature. Gary was speaking in the wake of last Saturday’s comfortable 43-17 home BT National League Division 2 victory over Preston Lodge, which has Biggar seventh in the standings with just two matches remaining. “I’m quite ambitious,” Gary said. “I wanted to win the league in my first year. “Reality is that it’s very rare for that to happen. “But you can’t arrive at a new place and simply say that you want to make up the numbers. “I will do another year at Biggar and hopefully we will get the right player recruitment done. “We just need to bring in the players who will complement the current squad. Although Biggar’s 2016-2017 has been a mixture of success and disappointment, Mercer said that a lot of the defeats could have been so different. “This season, nine of our 11 league defeats have been within three points,” Gary said. “Losing games by scorelines like 13, 15 or 11-15 absolutely kills you. If Biggar are to go for promotion by finishing top two next season, they’ll need to regularly produce the kind of form which put sixth placed Preston Lodge to the sword on Saturday. Biggar had secured their four try bonus point by half-time thanks to Aird Jardine (2), Richard Peacock and Andrew Jardine. 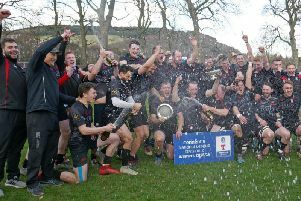 Biggar Rugby Club can reach 100 points in single season this Saturday! Further scores arrived in the second half for David Paterson, Andrew Orr and Aird Jardine. “We played really well,” Gary added. “It was satisfying to get such a very good win against a team that is above us in the table. It was a really good collective effort with really good tries scored. “The boys have been playing really fantastic rugby at times. “Our coaching group has got the best out of all the boys that are here. Every individual that has played this year has improved. Although top Biggar youngsters Ross Jackson and Andrew Jardine are likely to move onto Premier clubs soon, Biggar would apply for dual registration if this happened meaning that they could still play for Biggar on any weekend that they weren’t selected for their parent clubs. Biggar 1sts have no game this Saturday.